Leon the Chameleon by Mélanie Watt offers readers delightful adventures into a chameleon’s ever-changing world and memorable examples of complementary, mixed and primary colors. • the unmixed color of white from nothing. 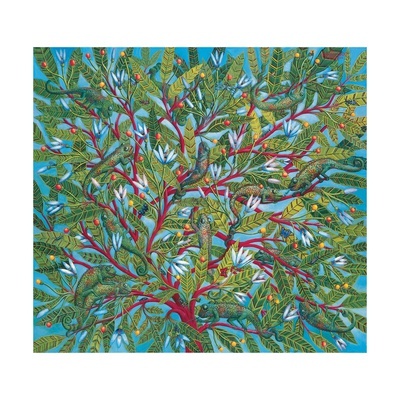 The colors-related lesson becomes enjoyably easy since the picture book in question facilitates forays into chameleons and changeable colorations. It simultaneously cooperates with second language acquisition since -- as is true for all of author/illustrator Mélanie Watt’s creations -- the story is available in French. In 1972 Jackson's Chameleons were introduced in Hawaii, where they are now deemed an invasive species; they have also been introduced in Florida. Unlike his peers, Leon does not experience easy formative years. Prevailing environmental colors exert no influence on Leon’s body coloration even though all of his peers merge with ambient blues, greens, and yellows. Competitors and predators therefore find it impossible to separate Leon’s colleagues from leafy, sandy, watery hideaways. red wads on dark or light green foliage. He has to worry about the high-profile presence which his non-functioning camouflage poses for hungry natural enemies. It nevertheless is helpful that orange, purple, and red tend to warn predators of unpleasant smells, tastes, and textures. Leon rarely joins his peers in such favorite team-building activities as camouflage and seek. He knows that like likes like so much that distances must be kept between a different-looking oddball and a like-minded trio. Concern for peers and hope for miracles nevertheless lead him to maintain unobtrusive distances when tracking the three friends. Tagging along manages to be one of Leon’s best decisions since the three friends’ long walk loops through territory unfamiliar to forest-dwellers. Their parents’ notice the three friends’ absence and organize a search. A green dot in the midst of the setting sun-reddened landscape offers to the parents first hopes for recovery and then realization of happy reunions and safe escorts back home. Leon the chameleon has a problem. When the other little chameleons turn green, yellow or blue -- he turns red, purple or orange! Leon doesn't turn the opposite color on purpose. He just can't help it. Mélanie Watt's acrylic and black ink artwork and authorship. Watt, Mélanie. 2010. 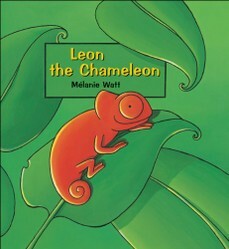 Leon the Chameleon. Toronto, Ontario, Canada; and Tonawanda, NY, U.S.A.: Kids Can Press Ltd.
Scaredy Squirrel is title #1 in Mélanie Watt's Scaredy Squirrel series. The Kids Can Press picture book shares a Canadian flying squirrel's nutty adventure. Have I Got a Book for You! by Mélanie Watt describes a salesman's efforts to sell his best-selling book and thereby models advertising, marketing, publicity, and sales pitches.